spinal chord directly behind the navel. Physically this chakra is related to digestive system and regulates heat in the body. This chakra is the source of the ‘vital force’ in the body, if this chakra does not function properly, then you will feel lifeless and devoid of energy.You will be hindered by poor health, lack of motivation and commitment, and depression in life.Therefore awakening of Solar plexus is necessary for all those who wants to enjoy life more fully. The Manipura chakra is symbolized by a ten petalled lotus. On each petal one of the ten letters: pham, dam, dham, nam, tam, tham, dam, dham, nam, pam is inscribed.In the centre of the lotus is the region of fire, symbolized by the triangle. 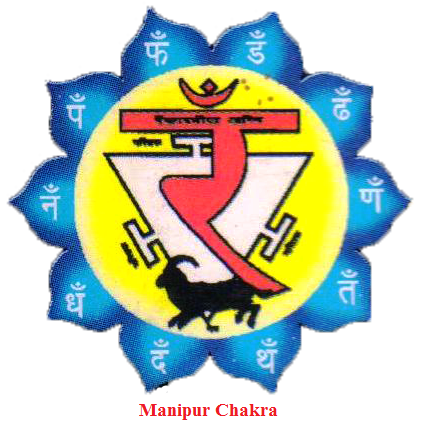 And within the triangle Ram is written, which is the beeja mantra of the manipura chakra. By meditating on solar plexus chakra, you will gain knowledge of the entire physical system, your body will become disease-free. And once your kundalini reaches Manipura, your consciousness will not fall back into the lower chakras. When yogi concentrates at the this chakra he achieves patal siddhi. Yogi becomes free from all diseases and acquires the hidden treasures below the earth. Its Beej mantra is RAM. Generally, ‘prana’and ‘apana’ functions seperately but When the manipura chakra awakens, these prana and apana gets united in the manipura chakra. Awakening of kundalini in the Solar plexus takes place like a blast, as the prana and the redirected apana meet in the navel region. It is the like the collision of two great forces in the Solar plexus region. After awakening of this chakra all his views and opinions completely changes. The personal prejudices, complexes are gone away and an endless beauty and perfection of the higher worlds dawn within his consciousness. This entry was posted in Smart astro guru, Yoga & Kundalini Shakti and tagged beejmantra ram, manipur chakra, manipur chakra in kundalini, manipur chakra in kundalini shakti, Solar plexus chakra by R. N. Sharma. Bookmark the permalink. I enjoy looking through an article that will make men and women think. Also, many thanks for allowing for me to comment!